Chelsea Manning is tweeting from military prison. 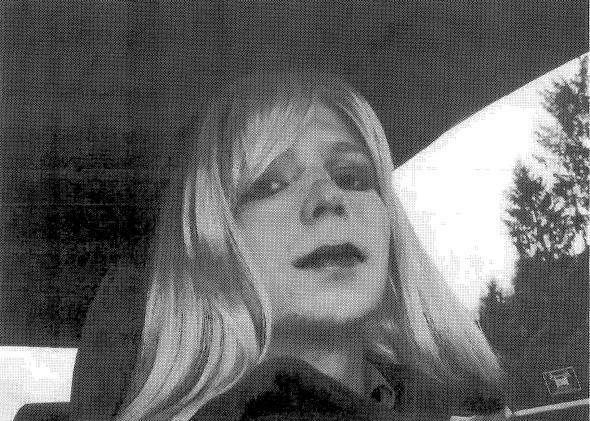 Manning sent this photo to a supervisor in 2010 with the caption “this is my problem.” Three years later Manning publicly identified as female and said she wanted to be known as Chelsea Manning. Chelsea Manning, the U.S. soldier who is serving a 35-year prison sentence for leaking thousands of classified documents to Wikileaks, has launched a Twitter account. Manning said she will be using a phone to dictate her tweets to communications firm Fitzgibbon Media, reports CNN. Her first tweet went up Friday afternoon, and by Saturday morning she already had more than 30,000 followers. Manning said she wants to tweet as often as possible but not about frivolous issues. “I’m hoping to stay connected w/ this account as much as poss., but would rather tweet about more meaningful things than not #lessismore,” her second tweet said. Manning also expressed hope she will be able to hold conversations with her followers through the platform. “It will be hard, but I don’t want this Twitter feed to be a one-way street/conversation,” Manning posted. Manning was convicted in 2013 of charges related to releasing State Department cables and military records and will be eligible for parole after serving eight years, notes the Wall Street Journal. Shortly after her conviction, Manning, who was then known as Bradley, announced she would seek hormone therapy. A Kansas judge, meanwhile, agreed to her request to change her name to Chelsea.